Under ordinary circumstances, diverting or selling food aid may qualify as corruption. 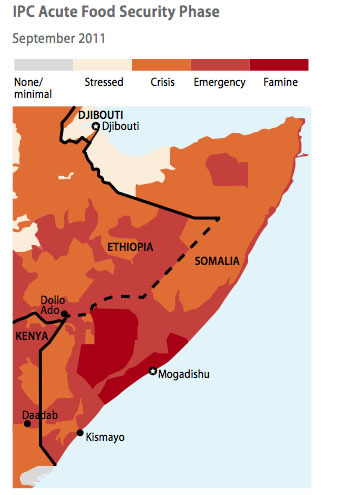 “With three quarters of a million people on the brink of starvation, they become crimes against humanity,” writes Somali expert Matt Bryden in a new policy paper published by the Enough Project. With more than 20 years working on Somalia, Bryden has watched food aid be manipulated for political aims before: The notorious al-Shabaab militia routinely denies access to humanitarian groups accusing them of being spies; allegations of corruption constantly plague Somalia’s Transitional Federal Government, or TFG. But the blockage of humanitarian aid—whether for political or personal aims—coupled with the immense need in Somalia caused by the most severe drought in 60 years should force the international community to prioritize efforts to force those responsible to account. One instrument of accountability already exists: United Nations Security Council resolution 2002 effectively prohibits the diversion of humanitarian assistance, as well as the kind of gross corruption that prevents the TFG from discharging its duties. But the Security Council has so far designated only a handful of violators for targeted measures, including travel bans and assets freezes. More designations are needed, followed by rigorous and diligent implementation to make sanctions bite. But sanctions are slow to apply, difficult to implement effectively, and are hardly sufficient punishment for crimes tantamount to mass murder. The time has come for either the International Criminal Court to become engaged in Somalia, or for a special international tribunal to be established, in order to dismantle Somalia’s deadly culture of impunity. Bryden currently serves as the coordinator of the U.N. Somalia and Eritrea Monitoring Group, but he wrote this briefing paper in his personal capacity. “Without justice, humanitarian assistance alone will have the perverse effect of absolving and even rewarding those responsible for this tragedy,” Bryden said.